Saratoga Springs’ newest, trendiest neighborhood is Excelsior Park, 129 apartments and 70 townhomes with one, two and three bedrooms, a short walk or drive to the heart of the downtown. Excelsior Park is a pet-friendly complex with ample parking. A standard-bearer for healthy living within city limits, Excelsior Park is proximate to a 20-acre preserve and wetlands with a protected path to Spring Run Trail, ideal for walking, jogging or snow-shoeing. 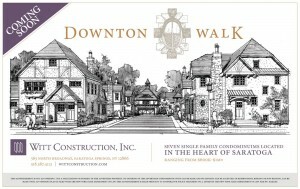 Witt’s seven-condominium Downton Walk neighborhood at 27 Jumel Place, in downtown Saratoga Springs, is in its final design stages and the date to break ground will be announced soon. This striking group of mixed-materials homes will feature both privacy and community, within a neighborhood setting. Each spacious, elegant home will offer unique Witt signature details and features, both inside and out, as well as a private yard. The cluster of upscale English-style homes is on the desirable East side of the city, within minutes by car or a short and scenic stroll by foot of the vibrant downtown, with its shops and restaurants, schools, parks, the library, performance venues, 11 movie screens, galleries and museums. Downton Walk is conveniently located near accessible major routes and highways. These are very special, one-of-a-kind properties and a waiting list of interested homeowners is already forming. For more information, please call 518-587-4113.